Chartered and opened in 1958, Ensworth School was built on a foundation of excellence, which is still evident today as a kindergarten through twelfth grade, coeducational independent school. The school opened its doors with 152 students and 10 teachers spread across eight grades and today enrolls around 1,131 students between its lower, middle, and high school campuses and around 150 employees. Rich in history and generously supported by its community, Ensworth School is one school with two campuses and prides itself in maintaining beautiful, well-kept, and up-to-date facilities. Red Gables, a large Tudor-style home in Nashville’s West End residential neighborhood, houses Ensworth’s lower and middle school, along with added facilities that include a library, music education venue, and athletic center. 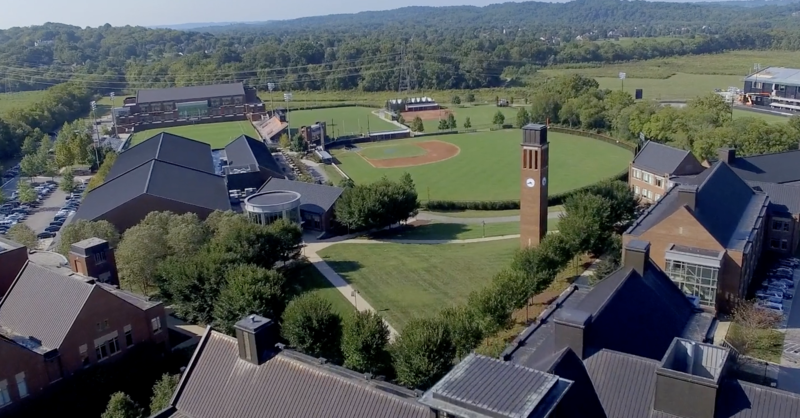 In 2004, Ensworth’s high school campus was constructed on a private, 127-acre historic site in West Nashville, and includes state-of-the-art academic, performance, and athletic facilities. “Many things make Ensworth School unique,” says Greg Victor, Director of Facilities at Ensworth School. “From the school’s prestigious enrollment standards to its academic achievements and resources to the extraordinary facilities, Ensworth School stands apart from other schools with its commitment to excellence,” Victor adds. Ensworth School’s commitment to excellence extends into the ways in which it chooses partners to help maintain the beauty and longevity of its facilities, and that’s part of the story that led the school to discovering Maxwell Roofing & Sheet Metal, Inc. Before Victor brought Maxwell to the Ensworth School table, the campuses had worked with eight different roofing companies primarily at the lower school campus. “After meeting Kathleen Maxwell at the local chapter meeting of an International Facility Manager’s Association, she made such a wonderful first impression and offered for Maxwell Roofing & Sheet Metal, Inc. to visit our campuses to assess our needs and make an offer. They came quickly to inspect and present a comprehensive maintenance plan that we couldn’t refuse,” affirms Victor. Ensworth School has now been working with Maxwell Roofing & Sheet Metal, Inc. for over two years. Their work began at with the lower school at Red Gables and quickly extended to the high school campus. Among the services that Maxwell Roofing & Sheet Metal, Inc. provides to Ensworth School are annual roof assessments, yearly preventative maintenance that includes inspecting and assessing potential problems, and forecasting for the longevity of our facilities’ roofs, which helps Victor and his team with budgeting. “It’s better to know any potential roofing problems or needs upfront than have surprises throughout the year,” says Victor. “As a facilities guy, you can’t always use who you want to use, but with Maxwell Roofing & Sheet Metal, Inc., we got lucky,” he adds. What makes the relationship with Maxwell Roofing & Sheet Metal, Inc. so good for Ensworth School? Victor says that communication is key. “Maxwell Roofing & Sheet Metal, Inc.’s team is always quick to respond. I can always count on Kathleen to take the message and quickly get the right person on the job. I deal with several companies, and it’s rare to find that type of responsiveness and attentiveness to our needs that Maxwell Roofing & Sheet Metal, Inc. provides,” affirms Victor. Victor says that Maxwell Roofing & Sheet Metal, Inc. has improved Ensworth School’s facilities most effectively through its preventative maintenance plan, as the school no has much less instances where repairs are needed. “Maxwell Roofing & Sheet Metal, Inc.’s reputation is among the best you’ll find, and everybody we’ve worked with on the team is thorough. They work around our schedule (not creating disruptions or distractions during the school day) and are very respectful of our environment. The team has done a wonderful job from assessment to construction to service,” says Victor. Ensworth School also appreciates the way Maxwell Roofing & Sheet Metal, Inc. takes each maintenance task by section as needed, while providing a concise, long-term, and proactive service approach. For other businesses or institutions on the search for roofing services, Ensworth School recommends giving Maxwell Roofing & Sheet Metal, Inc. a try. “See for yourself what Maxwell Roofing & Sheet Metal, Inc. has to offer. They will prove their worth,” says Victor.